Oh man, I wouldn’t survive with your husband long, lol. 🙂 I thought mine was bad, but I am not sure what ingredients in that list he possibly couldn’t like!?!?! This actually looks like a great meal to take out to Matt in the field! 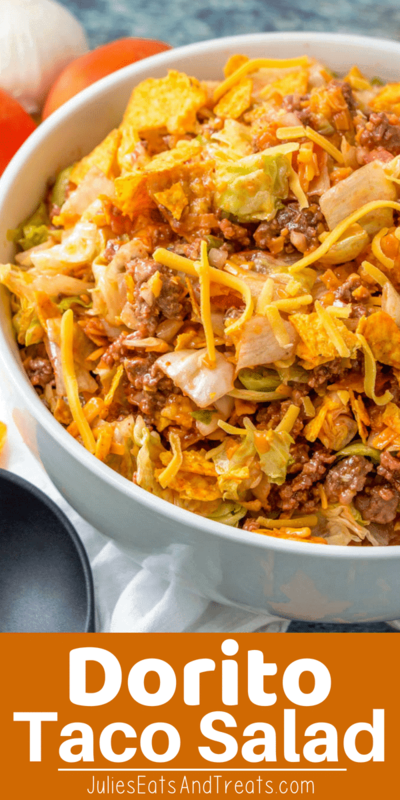 I can mix it all up (and sneak some ground turkey in there – he never knows when I go half and half) without the chips and just bring a bag of Doritos along. Haha no you would not. He’d be eating pizza every night and you’d be eating something gourmet! Sometimes I just ignore him and make something I’ll enjoy. He can pick something out if he doesn’t like it. Men….no adventure in their taste buds! I would add Penzeys taco seasoning to the ground beef. YUM!! 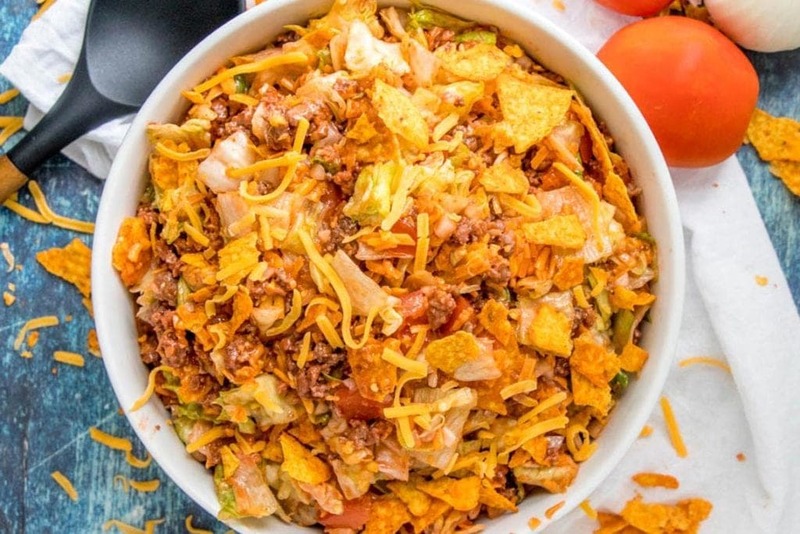 I haven’t thought of taco salad in ages but it’s perfect for this really hot weather! Can’t wait to make it! 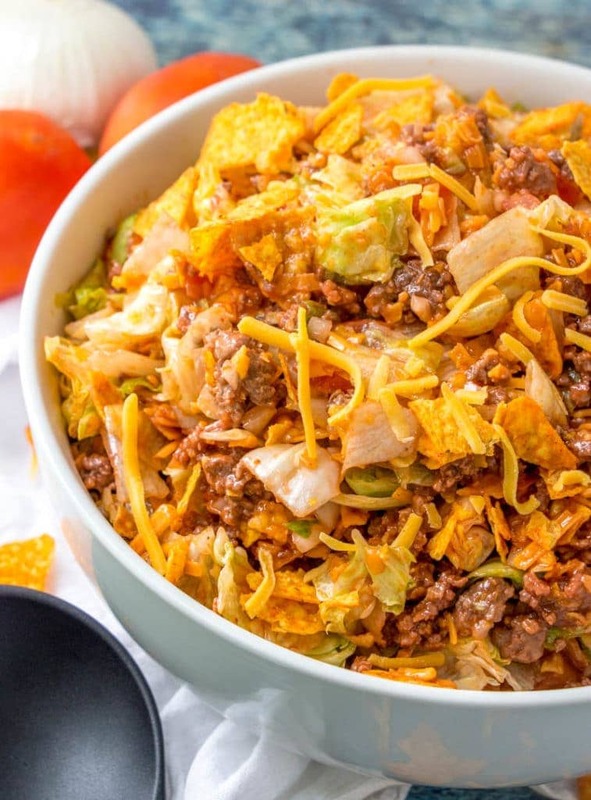 Taco salad is the best. I could eat it every day! I wish Jordan would eat it! That’s I feel about the hubs. At least the kid likes it so far! It’s great to think that you’re starting traditions. This combines some of my favorite flavors! I add avocado to mine & we also use thousand island dressing instead of Catalina. This salad is so good. 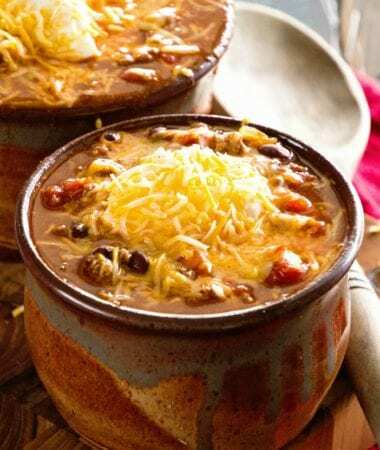 We add a can of red kidney beans that have been drained and rinsed. It is not the prettiest salad, but super yummy! This looks simple and delicious. But do you have ideas for substitutes for the Catalina dressing – stuff that would be available in foreign countries (in particular France)? Thanks! Do you have French Dressing? You could use that! Buy your munchkin Miss Missmatched socks, none of them match!! I wear them all the time and let’s just say I’m old enough to order mine from Amazon!! I’ve been making this for years. 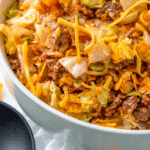 I do use taco seasoning in the ground beef. I also use chopped green onion rather than chopped regular onions. Great ways to mix it up! 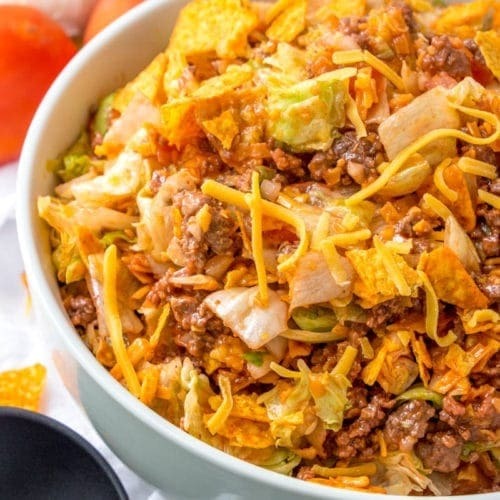 I make this but I use taco flavored doritos, taco seasoning on the meat, and green goddess salad dressing. It’s gone in minutes around my family. Love that twist on it! I’ll have to try it! 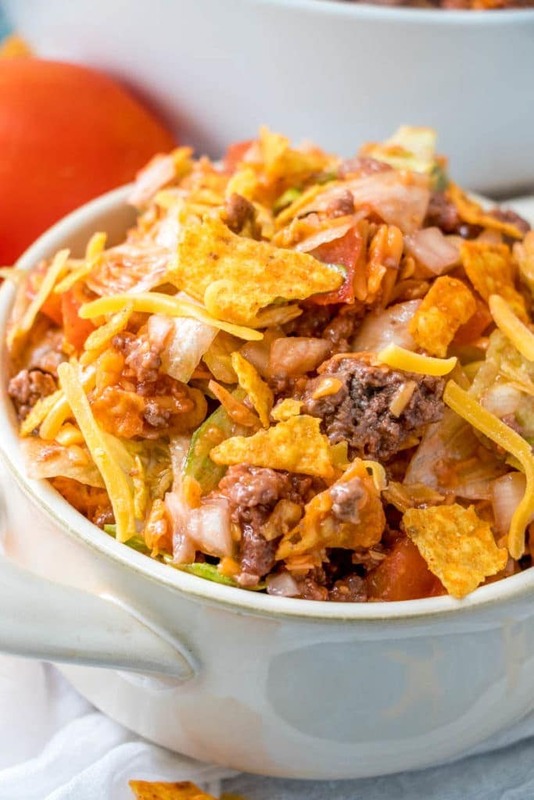 I make mine with taco seasoning packet in the meat and I don’t use any dressing on it but just have bowls of lettuce onions tomatoes taco cheese sour cream Doritos and the taco sauce in a bottle for the dressing..and don’t mix it all together but have each person make their own bowls the way they want them!! And this way the leftovers don’t get all soggy because you have mixed them altogether…. Great twists on this one! There’s so many ways to make it! Would this recipe work without meat? I’m asking because I want to serve it as a side to burgers and dogs. I think it would you might need less dressing because there won’t be as much salad. I really liked this but it was way too much for us and we dom’t WAnt to eat it every day for a week. I was thinKing I’ would ta ke Somme of it,add beef broth and maybe some other veggies and make a soup out of it. HAs anyone done that? Hi Linda, sorry you had the problem with the leftovers. It clearly states it feeds 12 people and also gives tips if you aren’t going to use it up in one serving on how to mix it for just a few people. Thanks! I made half the recipe and the two of us loved every single bite. Thanks for a great recipe!! So glad you enjoyed it! It’s one of my faves!